Here’s a sneak preview of the new William D. McDowell Observatory in DeKorte Park in Lyndhurst. The 2-minute video features an interview with Observatory Director John Sloan. Free viewing sessions for the public begin next Monday night at 8. NJMC naturalist Michael Newhouse saw this bird and its buddy on transmission towers near the Carillon on Disposal Road in North Arlington, and gave us a call. 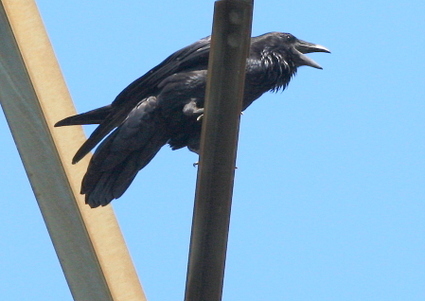 In previous years a pair of ravens has nested on Laurel Hill in Secaucus. More on ravens here. 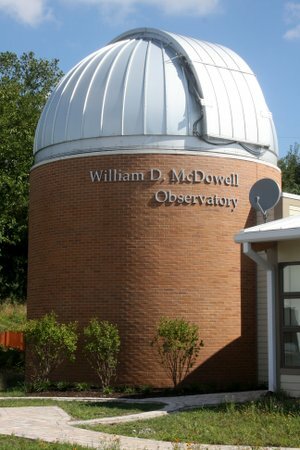 Starting next Monday (Sept.8), the William D. McDowell Observatory in DeKorte Park, Lyndhurst, is opening it state-of-the art telescope to the public every Monday and Wednesday evening, weather permitting. The observatory will be open for two hours each night, with 8 and 9 p.m. viewing sessions. The observatory houses a research-grade, optical telescope with a 20-inch mirror within a six-meter retractable dome. Click “Continue reading…” below for more info.